If you do not already own a hammock stand or a hammock then the most convenient option to consider has to be a hammock and stand combination set, for complete hassle free shopping a number of high quality brands have paired up their comfortable hammocks with sturdy and durable steel hammock stands to save you time and hassle when searching for a hammock hanging solution. Hammock and steel hammock stand combo sets are a great solution to avoid having to look for a hammock to fit a hammock stand you already own and vice versa. Although you can often buy hammock and steel hammock stands individually from many of the hammock stand sets below, the best and cheapest option is often to buy a hammock stand set that will have everything included for hanging your hammock perfectly. Below we have a wide range of hammock stands with hammocks included, from 9 foot long space saving steel stands with 2 person Brazilian hammocks to larger 15 ft steel stands that feature spreader bar style hammocks you will be able to find a steel hammock stand with hammock to fit into your home or outdoor space quickly and easily. As well as the horizontal hammock stands on offer we also have a large variety of upright hammock stands and hammock c-stands to choose from that come complete with either a chair hammock or a swing chair, ideal if you are looking for a real space saving solution and perfect for outdoor or indoor use fitting conveniently into a corner of a room. You can quickly view some of the vital information of each hammock stand on the product titles below including the length or height of the hammock stand as well as the maximum weight capacity of the hammock stand combo set, you can also view a quick summary of the ratings that each of the hammock with stand sets have received from our editor. Once a hammock stand and hammock set has taken your fancy you can read the full product description by clicking on the product and here you will also be able to read the hammock and stand reviews that have been left by buyers who have tried and tested each product. If you would like a little more information before deciding if a steel hammock stand with hammock is right for you why not take a look at our hammock with stand buying guide? In addition to make life as easy as possible for the consumer we have also listed some of the best hammock and hammock stand sets available below in the recommended area, here you can quickly see the main highlights of each of the highest rated hammocks with steel stand sets and read a short summary of why we and many others consider the particular hammock stand with hammock combo set to be one of the best choices around. If you are only on the lookout for a vertical hammock stand with a hammock chair you can view our recommended selection of these on the c-stands with hammock chair category page. 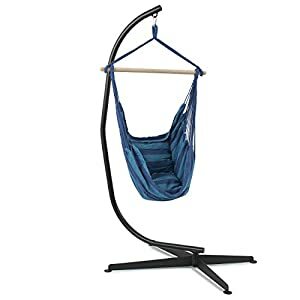 These two options are highly portable and great for saving space if used indoor or out, if you are looking for a 9 ft hammock stand with a Brazilian hammock we consider the options below to be the best 9 ft steel hammock stand with hammock sets, both are currently available at a fairly low price. By far one of the most popular space saving 9 ft hammock stands with hammock around with some incredibly good reviews. Combining a comfortable hammock with a very durable steel hammock stand this Vivere hammock stand set is head and shoulders above many of the other combination sets available and is often reduced. If you are looking for an all in one solution for lazing around in a hammock then this is the best hammock and stand set to consider. You can read all of the reviews and check out all of the color options on visiting the retailer or you can take a look at some of the other top quality hammock products from Vivere that are available. As one of the best garden furniture manufacturers around Vivere consistently make very good products and this affordable hammock and stand set is no exception. A similar option to the Vivere hammock and stand set that features a slightly smaller hammock, overall this is a good option to consider with many of the same features that the Vivere hammock set above also has. A very portable option that is easy to assemble and take apart, complete with a handy carry case this durable 2 person hammock and stand set is by all accounts very comfortable and sturdy. Available in 3 color options this Pinty space saving hammock stand with Brazilian double hammock has left many buyers incredibly happy and content and is in our opinion the 2nd best option to consider should the Vivere space saving hammock and stand set not be to your preference. If you are more partial to a spreader bar style hammock over a Brazilian hammock then the 12 or 15 ft hammock stands and hammock combo sets will be ideal for your needs, provided you have the space available. Based on popularity and reviews of the hammock sets we feel the two larger stand sets below are some of the best 12 and 15 ft hammock and stand sets on offer and both are available in a range of color options. Both of the sets below feature hammocks and stands that can also be bought separately from each other should you not require the full set. When considering the very high reviews many of the other Caribbean Hammocks products have received it is no surprise that the brand are one of the best at manufacturing comfortable and well made hammocks and solid, durable steel hammock stands. Both the hammock and the stand are available for purchase separately and have both also received very good ratings from a large number of buyers. The jumbo spreader bar hammock from Caribbean hammocks can be found here and the 15 ft steel hammock stand here. If you are looking for a high quality, long lasting hammock and stand set and don’t mind paying a little extra then this Caribbean Hammock Stand set is the perfect choice to consider. Not the most highly rated hammock and stand set around but certainly one of the most popular, an excellent choice to consider and features a hammock that is available in a range of colors to suit your preference. The main downside of this hammock and stand set is the 350 lb weight capacity, since the double hammock is suitable for two people a little extra weight capacity would perhaps have made this hammock and stand set a little more suitable for all. However if you and your partner combined weigh under 350 lbs combined then this is a great hammock and stand set to choose from a brand that makes some very good looking and functional hammock and garden products. Another great thing about Sunnydaze is that all of their products are backed with a 1 year manufacturers warranty so you can buy with complete peace of mind, you can view more Sunnydaze hammocks and hammock stands here, as well as view all of the hammock options available to you if you are considering this hammock and 12 ft stand set.